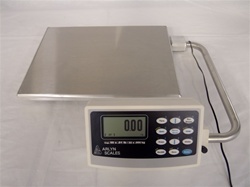 The 6200 bench scales have load cells that use strain gauge technology. As weight is applied to the scale, a component in the load cell bends. This bending changes the electrical resistances on strain gauges which are adhered on either side of the component, which are then measured by a Wheatstone bridge. The output from the bridge, which consists of analog electrical signals, runs through an Analog to Digital converter. The outputs from the converter are digital values that are then displayed on a large LCD screen. The Series SAW Ultra Precision Scales have much finer resolutions, and Surface Acoustic Wave (SAW) technology makes this high level of precision possible. SAW technology consists of two lithium niobate transducers that detect weight by measuring the bend of the internal load cell component rather than using the changes in electrical resistances that strain gauge load cells employ. Because the SAW load cell doesn’t have to convert an analog signal to a digital one, our Ultra Precision scales are inherently more accurate, are more stable over time, and are less affected by changes in temperature. The 6200 Bench Scales have aluminum frames and stainless steel platforms. The load cells are also made from stainless steel. While the lower capacity Series SAW scales have aluminum frames and stainless steel platforms as well, the highly accurate load cells are made from an aluminum alloy. This alloy has exceptional hardness, spring characteristics, resists plastic deformation, and performs consistently through a wide range of temperatures. The larger SAW-HL, SAW-JL, and SAW-KL scales are made out of stainless steel. The resolutions that the 6200 Bench Scales models provide through strain gauge technology are sufficient for many industrial applications, such as shipping. Applications in which very fine resolutions are required, for example formulating sensitive products such as pharmaceuticals or polymers, will be better served with the Series SAW technology. The simple question to ask is: How much accuracy do your scales need in order to meet your business and regulatory requirements? Keep in mind that even Arlyn Scales strain gauge technology has remarkable resolution due to the way we have engineered it into our scales. While you can order our scales with analog output if your application requires it, we do offer options for digital connectivity. A USB port will allow you to collect weight data to a flash memory thumb drive for later uploading to a computer or plug your scale directly into your PC. An RS-232 ports, which is two-way, allows connection to a computer for scale control and data acquisition. An RS-485 ports supports the networking of up to 10 scales. A wired Ethernet port lets you connect to a network with Internet access, and Wi-Fi enables wireless network connection. Our digital-ready scales are ideal for automating your business processes. Weight data can be uploaded into business systems and we offer software that can jumpstart an automation effort. The software brings weight data, which is held in the universally accepted CSV file format, into Excel spreadsheets or Access databases. You can download this software free of charge from our web site. In support of full automation, you can order Arlyn Scales products with the set point option. This allows scale data to initiate actions in other machinery in the automated process via up to eight relays per scale. If you have automation ideas but are not sure if they can be realized with the advanced technologies that Arlyn Scales offers, our engineering personnel will be more than happy to discuss the possibilities with you. Arlyn Scales products are very reasonably priced. We manufacture all scale subassemblies at our facilities located in New York, and all our engineering is done in-house. This enables us to build custom scales to your exacting specifications, should our standard product lines not meet your needs. Furthermore, you will be surprised at how affordable our custom scales are. This is due to our factory-direct business model, which eliminates the middle markups from dealerships. American manufacturing has been sent overseas for many years, but Arlyn Scales bucked that trend because onshore engineering and manufacturing has many advantages. Perhaps the most important advantage is innovation. By keeping our engineering and manufacturing facilities close together, communication lines within our company operate smoothly, which encourages innovations in scale design and highly efficient manufacturing processes. The high quality of our products is the best metric for reflecting this advantage, and although such a metric does not transfer to spreadsheets readily, our customers recognize it immediately. Our friendly customer service representatives are available to answer your questions and discuss your ideas. For help with the selection process or to discuss your unique needs and the possibility of a custom design, contact us by phone at (800) 645-4301 or through the form on our Contact Us page. For the latest technology, superior quality, and utmost value, contact Arlyn Scales today!